A sachet is an easy project to make, it's useful, smells great and it's a perfect place to feature some of your stitching. A simple sashiko design doesn't take very long to work and using a Japanese embroidery style is so fitting for an item of this sort. In Japan, zakka means "many things" and is a term used to describe a useful object that improves your home or life. (Amy Sinibaldi and Rashida Coleman Hale are two of my favorite zakka makers.) A pretty sachet certainly fits the zakka definition! These sachets make wonderful gifts, but you may want to just stitch up a bunch for yourself. Slip them into drawers to keep clothes and linens smelling fresh. 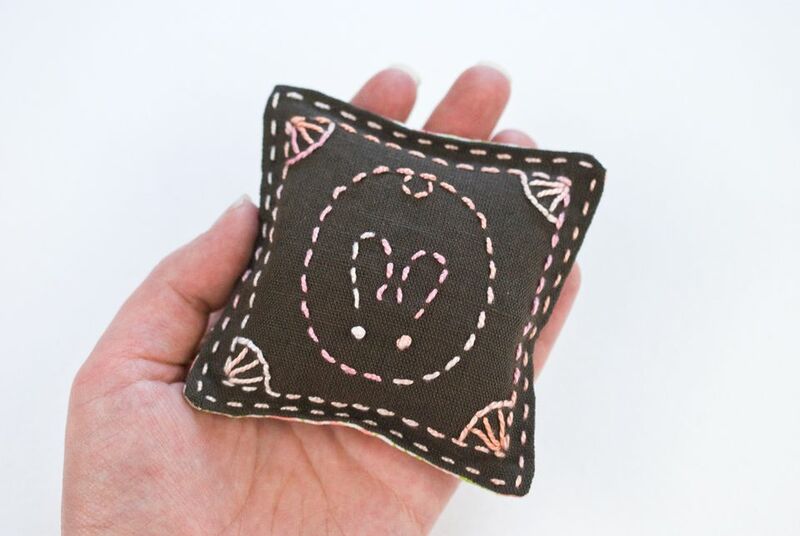 Put your sashiko stitching into practice and start sewing this sweet-scented zakka project! Sachets can come in various shapes and sizes, and this one is easily adaptable for whatever design you choose for the embroidery. It's easiest to work with a square or rectangle, and single sashiko motifs are perfect for this. Size the pattern to around 3 inches across and work the embroidery. You can also use a traditional sashiko pattern and frame it in a square, or choose a small piece of embroidery that you have on hand and have been looking for a way to use it. You can buy sachet filler, dried lavender, potpourri, or make your own with rice. Add about 10 drops of essential oil to about 1/2 cup of rice and mix it well. Allow it to dry before you add it to your sachet. Cut around the embroidery, leaving at least 1/2" of fabric on all sides. Cut a second piece from the print fabric for the back. The embroidery I used was a little less than 3", so I cut 4" squares. Pin the squares right sides together and sew around the sides with a 1/4" seam allowance, leaving about a 1-1/2" opening. Back stitch at each side of the opening. Trim the corners to reduce bulk, but don't trim so close that you snip the stitching. Turn the sachet right side out and poke the corners into shape. A chopstick works well for this, but I also find that using a pin to pull the corners from the outside can be helpful. With the seam allowance of the opening tucked inside and aligned with the already sewn seam, press to crease it and create a guide for sewing it closed in the next step. Fill the sachet scented filler. Working with 4" squares, I recommend about 1/3 to 1/2 cup of filler. The pouch should not feel completely full. Thread a needle with regular sewing thread and sew the opening closed. If you follow the crease you created, you'll have a nice straight seam. I recommend using ladder stitch to form an invisible seam. To finish the edges with top stitching, use sashiko stitch and matching perle cotton. Tie a knot in one end and hide it inside the sachet. Hold the sachet so the filling is away from the edge you are stitching. Roll the seam between your fingers to open the seam as you stitch, with stitching 1/8" from the edge. Work around all the sides and hide the ending knot inside. This last top stitching step is optional, and skipping it will speed up the process. But it's a nice detail to finish off the sachet.